When I think of fall, I immediately think of pumpkin pie but wanted to change it up a bit this year. So I‘ve updated the traditional pumpkin pie to pumpkin squares. They have a creamy texture with lots of pumpkin pie flavor. These can be served as a dessert with whipped coconut cream or as a breakfast treat with a cup of tea. This month we’re focusing on how to help you deal with pre-holiday stress to make your lives EASIER during the busiest time of the year. 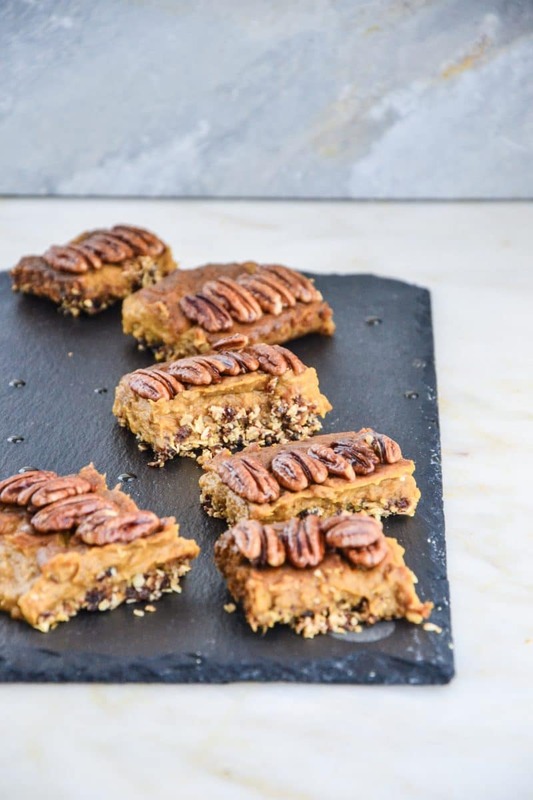 And these adorable dessert squares are easy breezy to whip up just before your holiday guests are about to walk in the door. No stress needed! I suggest purchasing all the ingredients a few days before so that you have everything you need in your kitchen so that when your company is about to walk in the door, you can pop these babies in the oven and your home will smell like Thanksgiving Wonderland…if there is such a thing! Click the PLAY button below to hear me walk you through the steps of how to make these sweet pumpkin pie squares. Combine the crust ingredients (gluten-free crust!) in a food processor until it forms a dough consistency and bake for 20 minutes in the baking dish. Combine all the pumpkin pie filling ingredients in a bowl and add to the baked crust. Bake for another 45 minutes, slice and serve with candied pecans on top. Note: These can seem a little bit crumbly when you’re slicing them so be sure to use a sharp knife to slice the squares all the way through for an even piece! 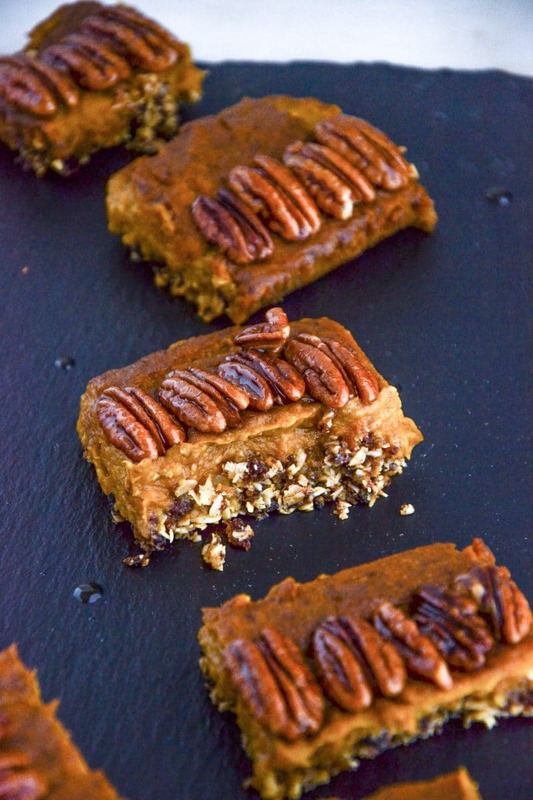 Quick pumpkin desserts are everyone’s favorite this time of year and these healthy pumpkin pie bars are adorable to serve for Thanksgiving and they’re ideal to make any time during the holiday season when everyone is yearning for delicious desserts that don’t weigh you down with refined sugar and gunky ingredients! 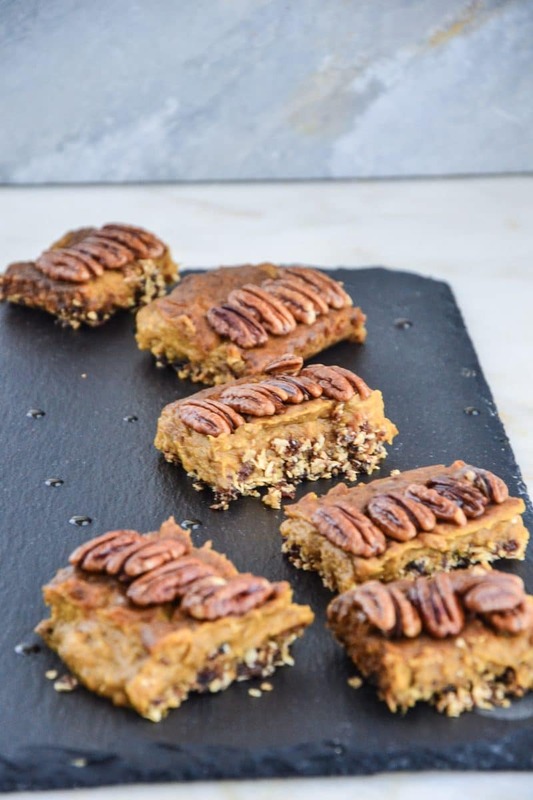 If you haven’t made pumpkin pie squares before, I highly suggest you make these ultra-easy pumpkin pie squares for your family….you won’t be disappointed! The oatmeal crust is so quick and easy to make; you can use it for other squares and pie recipes if desired. Make these squares for your holiday parties and everyone will be begging you for the recipe. They are THAT good. When you’re food shopping, try to buy organic ingredients. Here’s why I eat organic: The Benefits of Eating Organic. If you make this recipe, rate it below and post a picture of it on social media (tag @TheHealthyApple). 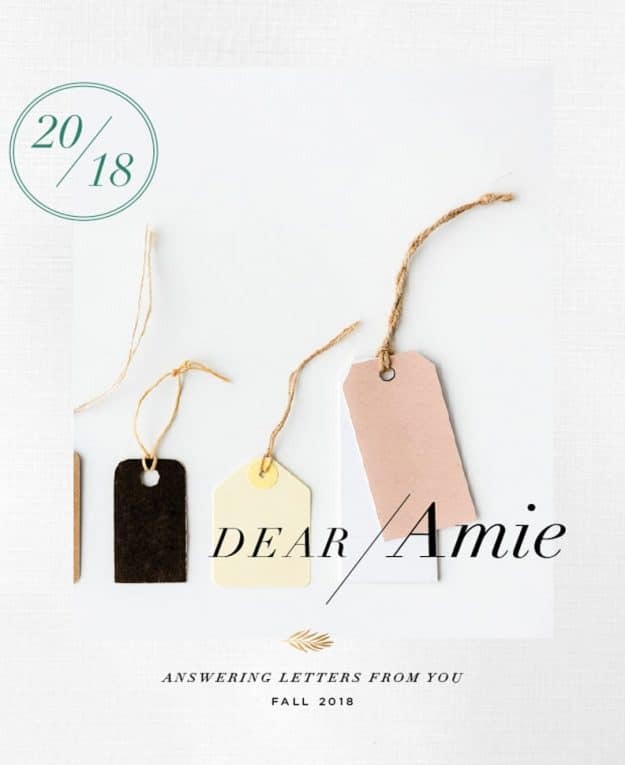 I’d love to hear from you; you can follow me and chat with me directly on facebook // pinterest // instagram // twitter or book a private session with Amie. These pumpkin squares are an update on traditional pumpkin pie. They have a creamy texture with lots of pumpkin pie flavor. These can be served as a dessert with whipped coconut cream or as a breakfast treat with a cup of tea. 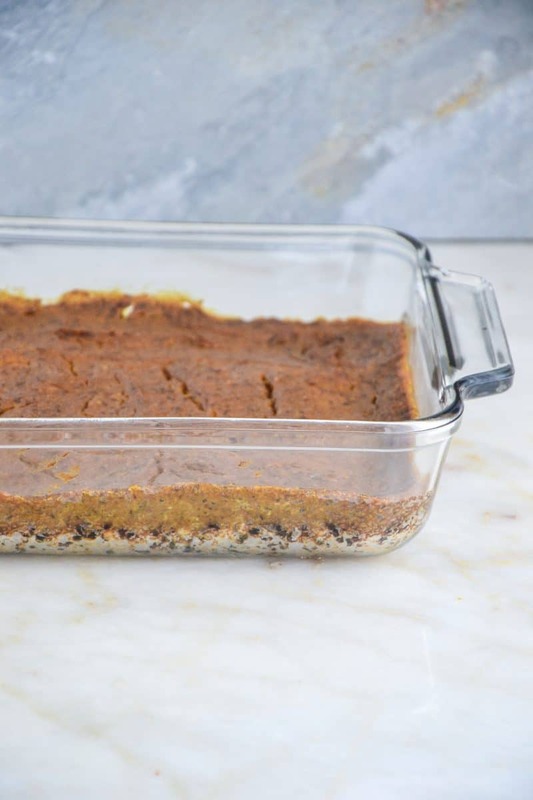 Grease 8x8 inch baking dish with 1/2 tsp coconut oil and set aside. Mix together ground flax seed and purified water and set aside until ready to make the filling. Place in food processor, pecans, oats, dates, sea salt and 4 Tbsp coconut oil to start, adding a Tbsp at a time up to 6 Tbsp, until crumb will hold together. 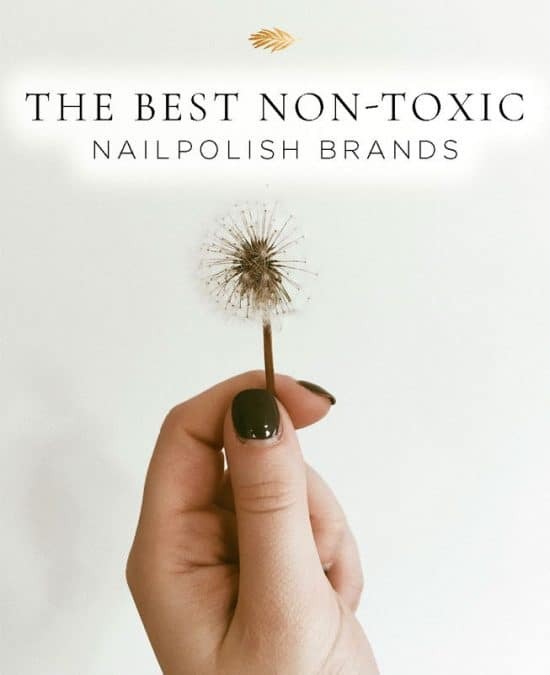 I found 5 Tbsp worked best for me. Remove from processor and press crumb mixture into prepared dish. I used a piece of parchment paper to help press into the dish, so crumb didn’t stick to my fingers. Bake for 20 minutes. Remove from oven and set aside. In a medium mixing bowl, add the pumpkin puree, and ground flax seed mixture, whisk together until combined. Now add to a separate small bowl, coconut milk, maple syrup, and vanilla extract, whisk together. Combine the coconut milk mixture with the pumpkin mixture, then add in pumpkin pie spice and sea salt, mix well. Pour pumpkin filling over prepared crust and bake for 45-55 minutes. The center might be a little jiggly but will set up as it cools. You will notice that edges are set. While the filling is baking in the oven you can prepare your topping. Prepare a baking sheet with a piece of parchment paper and set aside. Preheat a small nonstick pan on stovetop to medium heat. Add pecans, maple syrup, and salt, stirring continuously until there is no liquid left in the pan, about 2-4 minutes. You will notice the syrup has caramelized and coated the pecans. The coating will be soft but will harden. Remove from heat and spread on the prepared baking sheet, making sure they aren’t touching each other. It will take 20-30 minutes to set up. 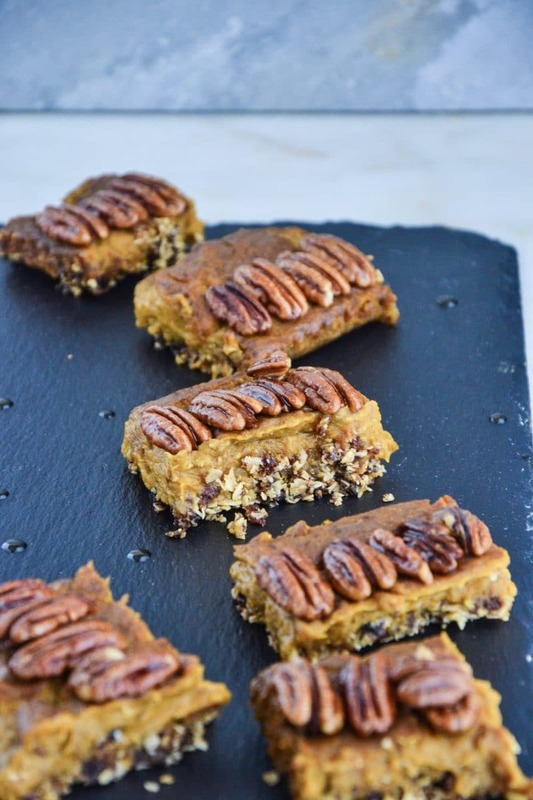 Once the pumpkin spice pie squares are set you can decorate with your candied pecans on top and serve. Keep in a stored container in the fridge for up to 5 days.